Hello and welcome to this week's edition of "Whiteboard Wednesday." Today I'm going to be talking about what counts as work experience, particularly on a vacation scheme or training contract application. Work experience is great and I think candidates sometimes think that we (law firms) just look at work experience just to show that someone is keen on a career in law. It's more than that. It gives you a great insight into the legal profession, it gives you a really good understanding of the role of a lawyer, and it gives you experience, it gives you exposure to the work. So, yes, we are looking for someone's commitment, but we're also looking to see whether you've developed some skills in terms of what a lawyer does in practice rather than just the academic side of law, which, many candidates can demonstrate on their application form. So, there's different types of work experience and we're going to go through some of those now. So, starting with formal work experience. By formal, I mean things like a vacation scheme. I think candidates always think that a vacation scheme is the best piece of work experience that they can have on their CV. And I think that could be right. It's highly relevant, it's law, it's usually in a commercial law firm, and you get assessed for a training contract during the vacation scheme, in most cases, so highly relevant. But then you've also got industry internships. And sometimes the question is, does the work experience have to be legal? And the answer is, no, but it has to be relevant. What do I mean by relevant? Well, something that's related to the way that law firms operate and the role that lawyers perform, and I'm thinking particularly in terms of clients. If you think about professional services, law is just a professional service similar to accountancy or management consultancy. So, if you have work experience in one of those organizations, that's highly relevant. Also, think about the clients that law firms have. Most commercial law firms will have clients like banks, energy companies, financial institutions. If you've got some industry work experience in that type of organisation, that's going to be very relevant because you'll know what they're expecting from lawyers. So, that can give you a bit of an advantage. So, yes, it doesn't always have to be law, but it has to be relevant. And industry placements are often relevant. This question, "Well, I initially started looking at the barrister route, realised it's very difficult, decided to look at commercial law instead." Well, that happens quite often and I think when candidates are at university studying law, it's completely acceptable that candidates explore both routes. So, if you have a mini-pupillage on your application form, it's not a negative, just pull out the key skills...whatever is relevant for the mini-pupillage. Often things like research, advocacy etc are things that you can demonstrate from mini-pupillage. That should be added on your application, don't leave that out. Open days as well. 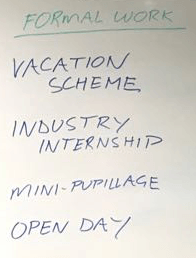 An open day is not going to be as relevant as a vacation scheme because it's one day and a vacation scheme is probably going to be two or three weeks. But you can still put it on your application form, still put it on your CV. If you've got five, six, seven open days on your application form, that does look good when you read a candidate's application because you'll know that they're interested and they're looking to identify the different types of law firms out there, different types of practice areas, etc. So, I would consider all of these to be formal pieces of work experience that you can put on your application form, but these are hard to get. And anyone who has applied for a vacation scheme will know this. Then there's informal work experience. So, by informal I mean, work shadowing. One, two days, it could be a number of weeks, but not formal, but informal. So, if you can't get formal work experience, try and get some kind of work shadowing. Then you've got paid work experience. Lots of candidates apply who are currently doing paralegal work. And that's good because paralegals often do a similar type of job as a trainee would do, often working in commercial law firms or national law firms, international law firms. So, you're exposed to the same environment, you're exposed to the same kind of work, and it's often for quite an extended period of time. A vacation scheme, in likelihood, will be two weeks, you could be doing paralegal work for six months up to a year. So it's very, very relevant. Then you have volunteer work. This is the type of work experience you can get involved in whilst you’re at University. So, things like pro bono. There's no excuse not to do pro bono work if you are at university. It's a really good indicator on someone's CV. It’s the same for legal clinics, doing Citizens' advice etc. The skills that will be required here are actually very similar to what the skills of lawyers will need advising clients on a day-to-day basis. 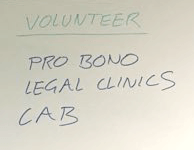 The knowledge, again, will be different, it will be at a different level, but you do begin to develop some of the skills that lawyers need (in practice) doing this kind of volunteer work. Then you have general work experience. Now some of this is probably less relevant, some of it could be very relevant. So, let's go through some of these. 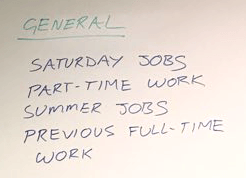 So, Saturday jobs, part-time work, summer jobs, the type of work that students often do, either during term time or outside of term time. But you've also got previous work experience as well. Sometimes you have career changers, people have worked in financial services or accountancy or auditing, and that's highly, highly relevant work experience. So, that should go in the application form. Candidates sometimes think that there's one piece of work experience, which means as a recruiter, I would think, "Yes, that's good enough work experience." It doesn't quite work like that. First of all, you evaluate an application form in its entirety. So, you're looking at the academics, you are looking at work experience, you're looking at the research the candidate has done in terms of answering the open text questions. And in terms of the work experience, usually candidates have a portfolio of work experience. Some of it will be highly relevant and some of it will be less relevant. And it's not to say you should leave any of this off, but it's just a sliding scale. Things like part-time jobs and summer jobs are probably going to be on the less relevant side. And then you move up the scale, so you've got pro bono work, the legal clinics, the paralegal work, industry placement, vacation schemes - which all are the highly relevant. We evaluate the work experience in totality. We look at it all. One thing I always advise candidates to do is don't leave off things like this. It might not be as relevant as paralegal work or mini-pupillage, but it's still relevant. And make sure you're picking out the transferable skills. And if you are submitting an application form and it's an online form and you get to write a little bit about every piece of work experience that you do. Try and write at least a paragraph on each one. Don't miss that opportunity. I've seen candidates who have done a vacation scheme, for example, and they just literally wrote, "I sat with the partner in the Property Department for two weeks." That doesn't really give us much insight. really utilize the work experience section on your application form. And, like I said, it's usually a mixture of different pieces of work experience that candidates have. So, it's not one piece of work experience which is relevant and one piece which isn't. Then we've got some questions which candidates often asked. And I think I've answered this one, "Does it have to be legal?" No, it doesn't. But a lot of candidates aim for legal, which is kind of obvious because you want to be a lawyer. So, things like a vacation scheme, mini-pupillage, open days. They all make sense, but does it have to be legal? No. But what I would say is it has to be relevant and professional services is also relevant and sometimes the work that clients do is relevant as well. And the other question that we often get asked, "Does it have to be in the UK?" No, it doesn't. Many of the international firms, global firms, obviously will have offices in different locations. If you've done two, three, four weeks work experience in an international law firm, that's going be as relevant as the work will be very similar and the environments will be very similar. So it doesn't always have to be in the UK. International work counts as well. So, I hope that's given you a bit of an insight in terms of what we consider to be relevant work experience, what work experience counts, and the type of things that you should be putting on your vacation scheme and training contract applications. So, I hope you find that useful. If you have any comments or suggestions for "Whiteboard Wednesday," just type them into the comments' box and I will see you next time. Thank you.